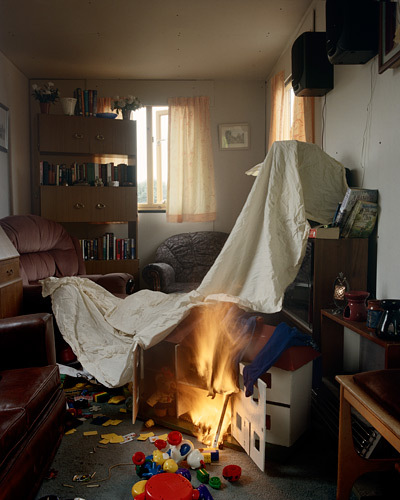 Sarah Pickering’s photographs of the training grounds used by the UK law enforcement and emergency services for disaster provision are as much a view on the complex manufacture of British society as they are a depiction of the fabricated environments. The young British photographer first rose to attention upon graduating from the MA Photography programme at the Royal College of Art in 2005 with her series Public Order. In that same year she also won the prestigious Jerwood Photography Award and the Photographers’ Gallery Graduate Award. In 2007 Pickering was included in the first major survey exhibition of photography at the Tate Britain, How We Are Photographing Britain, and the Victoria and Albert museum is about to feature work from her Incident series in an exhibition of the museum’s recent acquisitions (30th April – April 2010). 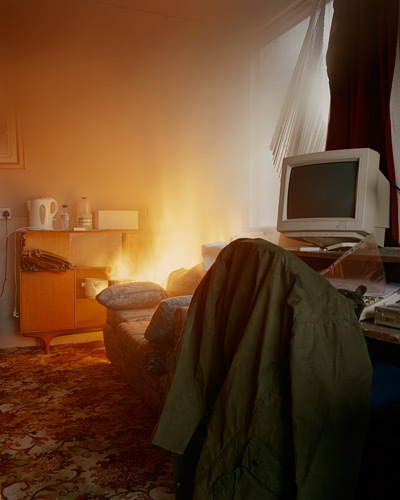 Later this year Aperture will publish the first monograph of her work featuring the four main bodies of work she has produced so far – Public Order, Explosions, Fire Scene and Incident. 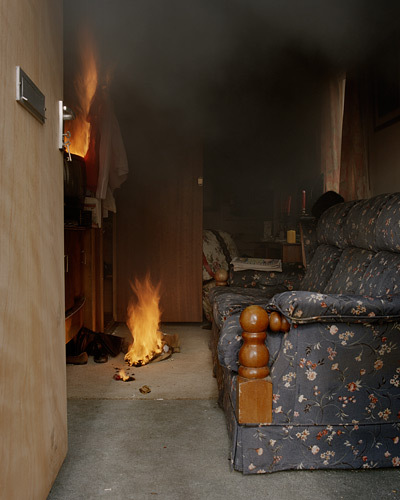 Here Pickering speaks about her practice with photography and her recent body of work Fire Scene. Anthony Luvera (AL): Why do you work with photography? Sarah Pickering (SP): I’ve always enjoyed being creative and finding an audience for what I’ve made. Even when I was 5, I remember getting real kick out of taking my eggbox crocodile round the school to show everyone, then making my Dad put it on the parcel shelf of the car so that it was on permanent display! I had a really great photography tutor on my foundation course and he introduced me to a wide range of photographers work and encouraged a conceptual approach to using the medium. I was always interested in the visual arts and actually when it came to making a decision about where to specialise I found it quite difficult. I was very good at drawing and making things, but photography really connected with the way that I think and want to communicate. I like the idea of working with a medium that is ubiquitous and transformative as well. I’m particularly interested in where the planes of reality and perception lie. AL: How did you come to make the series Fire Scene? SP: I was working with the Metropolitan Police on Public Order and one of the chief inspectors had been on a training course at the Fire Service College. A lot of the people I work with come up with suggestions. Maybe this is because my approach is not to be critical – I think it’s really important that these things are happening and I think they understand that it’s useful for people to see what goes on behind the scenes. So I was put in touch with the fire college and I met the guy who was head of marketing and he decided to make me an artist in residence. It wasn’t an official post, it was more informal, but it meant that they paid for my accommodation and that also helped me in the production of the work. AL: What do you hope to evoke in representing these constructed situations? SP: My ambition is for the work to hopefully go beyond questions of “is real or is it not?” I see it as being much more about the complicated social systems that are represented in the constructed scenarios. All of the burning environments in Fire Scene are particular types of places, representative of a particular group of people – usually low income. There’s always a suggestion of neglect or deviation. I think it’s fascinating in terms of how we (the general public) are being represented. Who are the people who have fires? Of course all sorts of people can have fires. Even the Queen has fires. For each space that I have photographed there is a very detailed accompanying narrative used by the trainee forensic investigators who only see the ashes once the rooms have burnt down. They have constructed witness statements and a bit of information about the supposed occupant who have got away – they always get away alive because there are never any burnt bodies! Even though you don’t see the ‘protagonists’ they are implied by the kinds of environments that are presented. AL: You have sustained an interest in the simulated and constructed environments of disaster preparation, law enforcement and emergency services training for over seven years now. What initially engaged your interest in this particular area and continues to propel you? SP: There are probably a lot of factors, but I think one of the main ones is the idea of living under the threat of terrorism – this heightened sense of fear amongst people. Certainly I have a lot of anxiety about the kind of problems we can face. When I was growing up my Mum used to check things a lot. She would be out and want to go back home to double check that the gas wasn’t on or that appliances were switched off. So I suppose I grew up thinking about some terrible thing that was potentially going to happen. Also I think threat is something that can be manipulated by the government. Depending on the times there’s always something to be scared of. There was the cold war and now there is terrorism. We’re always frightened about something. I’m really interested in looking at contingency planning and how the emergency services and other government organisations are preparing for these threats. It’s not enough to have someone blow a horn to symbolise a bomb going off. It’s more important to have a visual effect with a loud noise and lots of smoke and loads of people involved in the whole scenario. Even though we know these things are a fiction, how is it built it in to a training exercise to make it realistic and meaningful? AL: Tell me about your research processes and how you uncover and access the secure environments, grounds and situations that you have represented? SP: When I decided to apply for the MA course at the RCA, I thought it would be amazing to make work about simulation. So I wrote to Scotland Yard and found out who were the right people contact. I got in touch with all of the emergency services, though I particularly wanted to work with the anti-terrorism squad. Unsurprisingly they weren’t very interested in working with me but I didn’t have any sense that it would be inappropriate to ask. I think by doing this kind of thing there’s always going to be someone in some places who’ll say yeah that’s fine – they won’t see a young female photographer as a threat in terms of security. Then a lot of the rest of my work has come about through existing contacts from the initial work with the police when I made Public Order. AL: One of the aspects I find particularly interesting about Fire Scene and indeed your other bodies of work is the absence of people. I don’t mean the fictitious protagonists but the actual people who are learning from the practical function of these situations. By representing these events and environments as depopulated spaces, it might be said that in a sense you are decontextualising these environments from their actual purpose. Why have you chosen to picture these environments, situations and events in the way that you have? SP: The work I had been making before Public Order was very considered studio-based still life. I would find objects that had lots of resonance and bring them into the studio to make photographs. I’ve always been much more of a slow kind of photographer and I like the idea of the ready-made. When I was first photographing for Public Order the rioters and the police were there and I photographed it all going on but it felt like inadequate reportage. In my work with the training grounds I can’t displace aspects of the structures or environments so it was about going in there. I’m less interested in their process or practical function and more interested in the power and potency of the spaces. AL: In some of the Fire Scene images the titling appears to be a straightforward caption for the depiction of the ignition (such as Chip Pan, Electric Radiator or Cigarette), while in others it’s a little more ambiguous and potentially charged with preconceptions about the social position and living situation of real people (I’m thinking particularly about Insurance Job or Glue Sniffing Kids for instance). Can you explain how the actual re-created situations relate to your choice of titles of the individual works? SP: I thought it was important to empty out too much direction. Some people have said that they feel the titles pin down what the image is about too much, but if you look carefully for instance in Chip Pan, it’s piles of newspaper on the floor that are burning. What is a chip pan fire and what would it look like? Surely it would look different every time. These things are ephemeral and can’t be pinned down. It’s like trying to know something that’s not really knowable. AL: One of the interesting aspects of your sustained investigation is how it replicates the world but it only replicates a certain part of the world that might be seen as needing to be controlled in some way. The street environments depicted in Public Order might be a housing estate in Deptford. The interiors of Fire Scene might be inside the homes on that estate. These are not training grounds for Sloane Square or the Borough of Kensington & Chelsea. How do you think the replicated environments depicted in Fire Scene, and even in your other works such as Public Order or Incident might serve to perpetuate preconceptions about the social position or behavioural patterns of real lives? SP: Yes it comes down to this idea of the “unruly mob”. A social scientist once said to me when looking at the Fire Scene work that he felt these particular environments are constructed to help the trainee officers and investigators go in and deal with these kinds of places because they’re something other than what they may have experienced in their own lives. I thought that was an interesting suggestion. I think for all of the work that’s being done in general towards inclusivity, class is a particular area that seems to get waylaid. AL: You have mentioned that in a way your work stems out of the kind of interest or the wider preoccupation that society has with threat. In each of the main bodies of work that you have produced so far there is an element of uncovering that which is guarded, unseen or hidden from the view of the general public, but in fact exists as some kind of measure for public protection. What do you think is to be gained from knowing that these places, experiments, situations and activities exist? Why you think that we should know about them? SP: Maybe it’s more that I feel like I should know about them. I find that in being an artist and actually making the work you’re not really seeing it in terms of the exhibition. You’re seeing it in terms of your own investigation and then the show is the by-product of that. I love trying to infiltrate spaces and places and organisations and institutions and I think this is a fascination shared by many people. My photographs are a form of evidence but at the same time present these spaces as complicated and fictitious.